CV Distiller: an amazing collection of spirits! Over 200 whisky labels, an interesting fixation with cognac and an even more intriguing obsession with aged spirits and rare vintages. CV is not just another bar. It has one of the most impressive collections of spirits in Athens; a largely undiscovered treasure that only very few know about and even fewer can appreciate. The “diamonds” are displayed prominently. You find yourself staring in wonder, like a kid in a candy store. The first to grab your attention are the cognacs. A Frapin VS Grande Champagne Premier Cru stands imperiously; the Leopold Gourmel XO is present in both its Age du Fruit and Age des Epices versions (in decanters, 10 and 20 carats respectively), while the Chateau de Beaulon 1976 is a very rare single estate cognac! The bar has been set equally high with the choice of Armagnac, ranging from Chabot Superior to Marquis de Montesquiou, both in Extra Old versions, and many other fine brands for fans of the single-distilled French brandy. But the star of the show is undoubtedly whisky. More than 200 labels dominate much of the impressive four-level bar, grouped by category in a way that accentuates its preponderance, although I am not sure how many customers actually appreciate this. Four Tennessee offerings, over 10 Bourbons, and labels that include Scotch Hedonism and Monkey Shoulder, Irish Midleton 1996 and Bushmills 10, 16 and 21 year old, Japanese Nikka from Pure Malt to Miyagikyo 10 year old… before returning to Europe, and Scotland in particular, proudly represented by Aultmore 1995 from Speyside, Aberlour 10, 15 and 18 year old from the Highlands, along with peaty gems from Islay, such as the Bunnahabhain 18 year old. But the whisky “grand opera” does not end here. It continues with more surprises in the shape of special aged whiskies such as the Lagavulin 25 year old single malt, as well as Irish “cousins” from the 1978 and 1982 vintages. The man behind CV, the unsung hero, is Stefanos Psyllakis, who has clearly turned his enthusiasm and passion into something very tangible rather than simply undertaking a business venture. Rum too holds a place of honour at CV, with dozens of choices, again neatly categorized according to geographical region: Barbados, Colombia, Peru, Cuba, St. Lucia, Jamaica, Nicaragua, Venezuela, Trinidad, Guatemala, Panama, Martinique and many other countries which comprehensively represent the world’s entire production of rum! As for labels, brace yourselves for St. Lucia Distillers 1931, for exquisite Ron Varadero, for Peru’s impressive Ron Millonario XO, for Columbia’s Dictador 20 or a rare Mount Gay 1703 from beautiful Barbados. And for a very special occasion, the El Dorado 25 year old special reserve, which you will not easily find anywhere in Europe, let alone Greece. Prices can be something of an issue. But this is understandable when you consider that CV has over 30 labels with a retail price of more than €800 per bottle. However Mr. Psyllakis is very accommodating in this respect, offering each precious glass at cost price. This means customers can savour a Chateau de Beaulon cognac, as mentioned previously, for €75 per glass. Although there is a huge selection of fine spirits for prices that start at €8 a glass. Due importance is also attached to the other spirits on offer, with tequila catering for palates in search of anything from Sierra Milenario Extra Anejo to the Patron family, along with 10 more excellent choices of agave spirits, whilst gin plays second fiddle, but only in terms of quantity, not quality. A Monkey 47 or Tanqueray 10 certainly do not suggest any “demotion”, although it is striking that they have been placed on the first shelf and may thus go unnoticed. The situation is much the same with the vodkas, though the Stumbras with its stalk of wheat definitely catches the eye. Proper attention has also wisely been given to the accompanying nibbles, with special platters of Provencal cheese, delicious cold cuts and truffles, a variety of fish roe, Valrhona dark chocolate pearls and similar delicacies. I don’t want to dwell on the cocktails. I see no reason why the bramble, the margarita variations or the “clever” names in general should even be on the menu; they certainly don’t fit in with anything referred to above and only detract from rather than elevate this particular bar. But I would like to see the real classics, the lesser known and those that only legendary celebrities knew how to enjoy. And if he wanted to impart extra gravitas to his offerings, then I would want to see small barrels of fine aged spirits, “smoked” cocktails (with herbs, aromatic plants, wood, etc.) which I believe would be more appropriate to his other choices. Lastly, I should add that I really missed a good selection of cigars, which I would like to have seen in a separate menu… even if it were to replace the unfortunate cocktail menu. CV is not a bar for everyone. 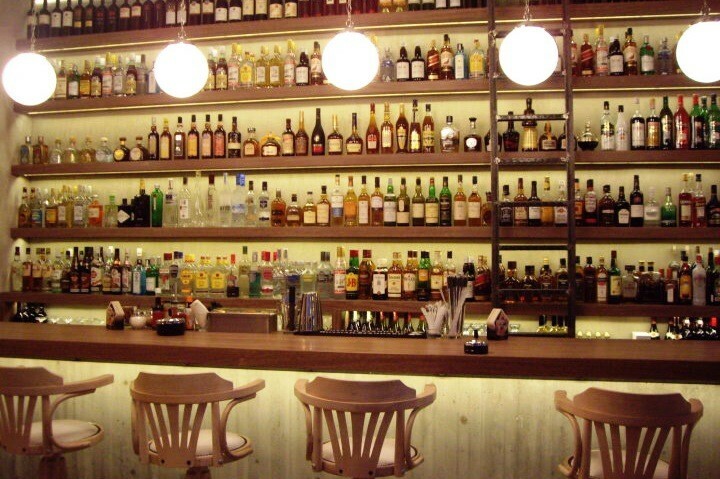 It has soulful music, atmospheric lighting, fine cuisine and a regal collection of spirits. I don’t know if its intention is to educate people or simply to please the few, but either way it succeeds admirably. P.S. : The fact you can sit so close to a 104-year-old numbered Pedro Ximenez is, I believe, enough to convince those few that they should at least make a pit stop here.